From January 1st to January 31st, submit short stories and essays of up to 25 pages or a set of 1-3 poems. Winners in each genre will receive $2,000 and publication. All entries will be considered for publication, and more than one manuscript may be entered. Before you submit, please remove your name and any other identifying information from your manuscript. Simultaneous submissions are okay, as long as you contact us should the work be accepted elsewhere. 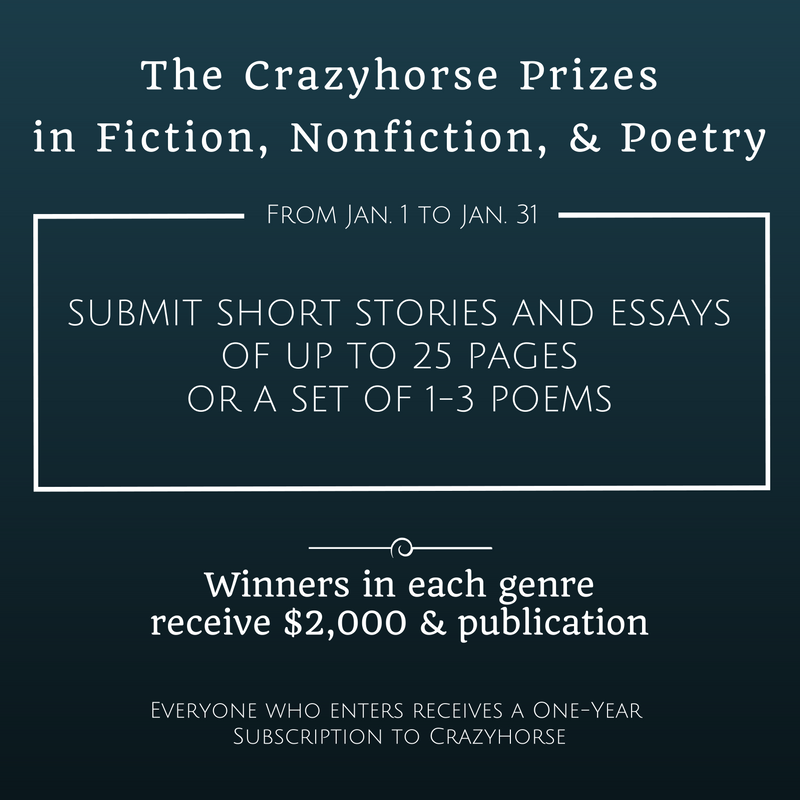 The $20 entry fee includes a one-year subscription to Crazyhorse. CLMP’s community of independent literary publishers believe that ethical contests serve our shared goal: to connect writers and readers by publishing exceptional writing. We believe that intent to act ethically, clarity of guidelines, and transparency of process form the foundation of an ethical contest. To that end, we agree to 1) conduct our contests as ethically as possible and to address any unethical behavior on the part of our readers, judges, or editors; 2) to provide clear and specific contest guidelines—defining conflict of interest for all parties involved; and 3) to make the mechanics of our selection process available to the public. This Code recognizes that different contest models produce different results, but that each model can be run ethically. We have adopted this Code to reinforce our integrity and dedication as a publishing community and to ensure that our contests contribute to a vibrant literary heritage. 1st Round of Judging: Blind Read by Genre Editors. Finalists (approximately 10 poems, 10 pieces of fiction/prose, and 10 pieces of nonfiction) will then be forwarded to the Contest Judges for the 2nd Round of Judging. 2nd Round of Judging: Blind Read by Contest Judges. Judges change on a yearly basis. Winners and runners-up will be announced by June 1st. Conflicts of Interest: Anyone with affiliation with a judge is ineligible to enter in that category. We also ask that past winners of our contest refrain from entering until two years after their winning entry was published.